Earlier this year, I was introduced to Bible journaling. I purchased a Bible journal for my daughter for Christmas and after seeing her Bible, it made me want to purchase one of my own. I've been pairing my Bible study with time spent illustrating my faith and I have really been enjoying it. My new Bible is beautiful and I have had many comments and compliments on it when people see it. The comments usually turn into a discussion about Bible journaling. Many people haven't heard about it and are interested in seeing what illustrating their faith would look like to them. I recently had the opportunity to share a glimpse into Bible journaling with a small women's group from my church. Since I knew they wouldn't have their own Bible with blank pages to journal in, I created an Illustrated Advent book and I want to offer the same book up to you, my readers as well. 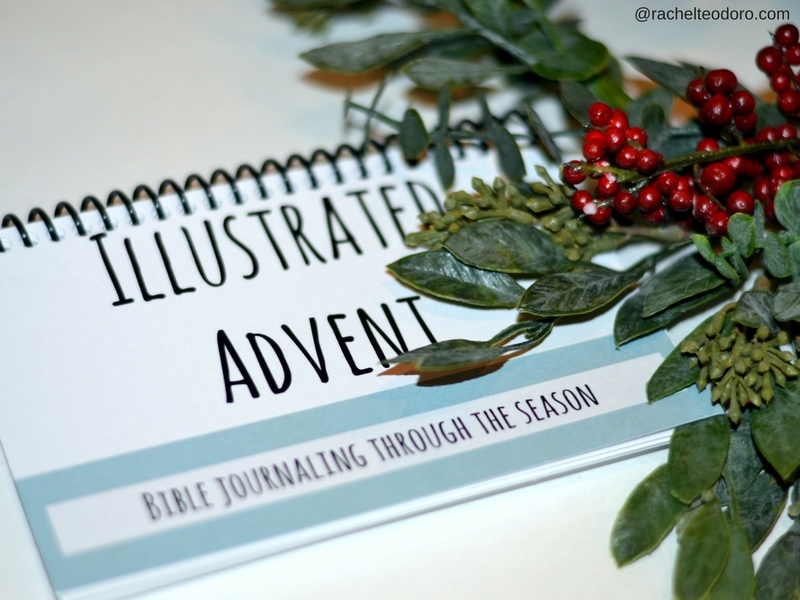 Illustrated Advent is a Bible journal that can be used through the Christmas season. It's a daily devotional that can be used throughout December as a way to reflect on the word and prepare your heart for the season. Illustrated Advent downloads as a PDF file. I recommend that you print it on card stock. You can print it and have it cut and bound like I did for around $7. The pages are made to be printed as a 4x6 copy. This will give you enough space to reflect on a verse but it's not so overwhelming for the first time Bible journaler. You can also print Illustrated Advent on your home computer. This will give you more room to use for your Bible journaling and it will be a cheaper alternative than taking it to your local copy store. Just make sure to use card stock for the pages so that they are thick enough to support all the fun illustrating that you will be creating. That's what I did for my personal copy and I ended up printing two slides to a page and simply cut it in the middle of the page to create my journal. The Illustrated Advent book I created isn't meant to sit down and do all the pages at once. It's meant to act as an advent devotional for the first 25 days of December. Each day has a different verse to study and think on to prepare you for this Christmas season. 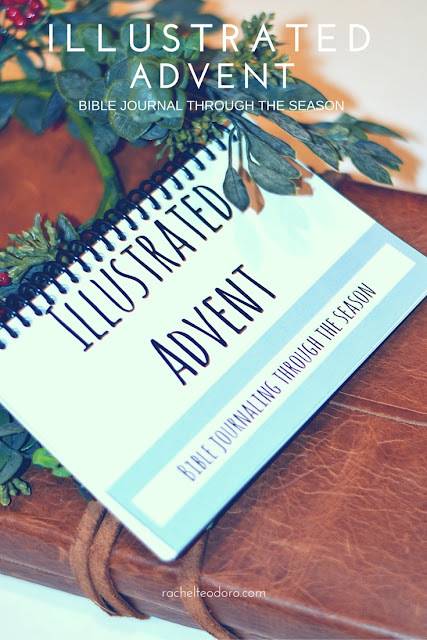 Download your copy of Illustrated Advent today. disclaimer: this post may have affiliate links. By clicking on them and purchasing through them, I may receive a small commission. These small purchases help me to continue to keep writing content and creating at Rachel Teodoro. Is this only a scripture on each day's page or a devotional topic each day? Hi Lyn! Yes, each day has a scripture verse that you can use as your daily devotional. There is no devotional topic listed only the verse so that you can use the verses as your personal reflection for the day. They were created in a way to walk you through the birth of Christ. So the download is for daily artwork scriptures? Just checking in order to know what the purchase is. Thank you! No worries Lyn! Look at the post above. There are two separate images that give you a good look at what each page on the inside looks like. There is a day and a verse. If you follow along on each day starting on December 1, you will finish with the birth of Christ on the 25th day or December 25. You can start whenever you want though. It just works as a guide for you and provides a space where you can practice your Bible journaling skills or do your own reflection on each day and keep it as a journal. Hello, I'm a newbie to your blog (found you on DaySpring) and just love your words and thought process; however, I am somewhat disappointed that the "Illustrated Advent" didn't have one single illustration it. I'm not a natural doodler, but I enjoy bible journaling and hope to be able to include pictures. And as someone who has always been interested in the advent process, but have never study and engaged in advent activities, I thought this would be an easy way to kind of bring it all together (bible journaling, advent study, etc.). But the error was mine --- I looked at this on my phone (which is a no-no for me! )and purchased it without looking at it on my computer first. Anyway, I will see what I have in my IF kits that I can use to complete this little project. Hopefully, you will be doing this so I can follow (and hopefully, come out with a nice end product. Thanks! Hey Mandy! I'm sorry it's not exactly what you were expecting but I think you can really enjoy it anyway. I made these with the idea in mind that someone who didn't have a journaling Bible could get a little introduction to what it was all about. I love the feedback and will do my best to see if I can give a tutorial or walk you through a few days throughout the advent season. In the meantime, I do have a few tutorials on how to get started Bible journaling and some other tutorials that may be helpful for you. Hey Rachel! No worries; Illustrated Faith had the perfect Advent kit! It gives an explanation for each week and some cute graphics; so all is well! I will see how my group and I can use your download to put it all in! Hope you and your family had a happy and blessed Thanksgiving!